William Smith founded a post office, the second in Greenwood County, at the site of Stony Point. Smith also founded a store at Stony Point (1, p. 2-3). William Smith began construction of the house (1, p. 2-3). 1824  William Smith died before the house was completed. His son, Joel Smith, purchased Stony Point from his father's estate and finished construction of the house (1, p. 3). 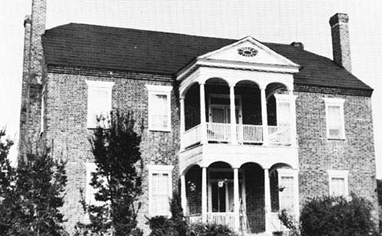 1855  David Wyatt Aiken married Joel Smith's daughter and would own the plantation after Smith's death in this year (1, p. 2, 5). 1975  Donald Hawthorne was owner of record (1, p. 1). 2002  John and Missy Lowery purchased Stoney Point and completed a renovation of the house. Missy's sixth great-grandfather, William Smith, established the plantation (3). The house is of Flemish-bond brick construction. The foundations of the original kitchen and carriage house remain on the property (1, p. 2). Information contributed by Missy Lowery whose sixth great-grandfather, William Smith, founded the plantation.